WHERE DOES CHINA GET MOST OF ITS “ANTI-FASCIST” TECH? FROM THE U.S.! The idea that China imposes the most oppressive “anti-fascist” technology on every laptop, street corner or shopping venue in the country comes as no surprise. The idea that the U.S. invents the latest and greatest in surveillance technology is also no surprise. What may surprise readers is that most of the technology used in China comes from the U.S.! First, China invites in the U.S. tech supplier, which can be anything from Apple to an obscure sub-contractor. Next the U.S. company finds a market share and good profits from distribution in China. No surprise there. What comes next is a shock. 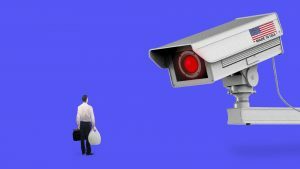 After building out a decent market share in China, the U.S. company is asked to supply the latest and greatest in U.S. anti-spy technology, including digital-scanning cameras mounted on street lamps and built inside laptops. The U.S. company knows it can quietly say “yes” and sell the technology (probably under some obscure name). Or, it can say “no” but at the expense of what is now a profitable China mini-monopoly. What usually happens, as shown in this article, is that the U.S. company says “yes” (under some assumed name) and the technology is made available and life goes on. Now, that backstory is coming to life in the U.S. media. We’ll see what happens next, but don’t be surprised if Congress intervenes with some legislation that bans compliance, requires withdrawal from China, and imposes sanctions on Chinese companies for being part of a government complex that is trying to pull this off. In the end, the Chinese rules won’t work, but the backlash is just beginning.